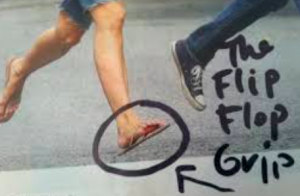 With warmer temperatures both here and abroad, it is more comfortable and convenient to slip on a pair of flip flops, but people do not realise why they are not the best footwear to wear. Studies ha ve shown through analysing participants gait, that whilst wearing flip flops, changes occur to your gait cycle. Even when walking, we are dependant on a good big toe push off. However when wearing flip flops, all our toes become scrunched to allow the shoe to stay on whilst the heel comes off the floor. This causes the plantar fascia to become over stretched and if repeatedly done over a period of time, not only does this change your gait cycle, it also affects your foot mechanisms and every other joint in your lower limb, pelvis and lower back. A lack of arch support in flip flops is also a contributing factor to an altered gait. This can put excessive and unnecessary stress on tendons, ligaments and muscles. Other complications that canoccur from wearing flip flops over a long period of time, relate to your foot health. Fungal infections and dry, cracked heels and calluses commonly occur. So what is the best advice in regards to wearing flip flops…. Only wear them for short periods of time. If you can find some with additional straps on them to try to add support to your feet and ankles. Make sure you stretch your calf and achillies afterwards to compensate for the strain that they have been put through. From personal experience, walking the Las Vegas strip numerous times in 2013 in flip flops, was a bad idea. It resulted in a long period of Achillies tendinopathy. Did I learn… No….until this year. I only wore flip flops to and from and around the pool on my recent holiday and then threw them away so I did not come home with them. It did aggravate my achillies slightly but after plenty of stretching and accentric loading of the achillies and calf muscles, I am now able to walk pain from in the mornings!